Photo by: Gilmer County Public Safety. Police haven't released many details on the crash but they're asking the public to avoid the area. ELLIJAY, Ga. — Traffic in a north Georgia county has come to a standstill due to a significant accident Thursday afternoon. 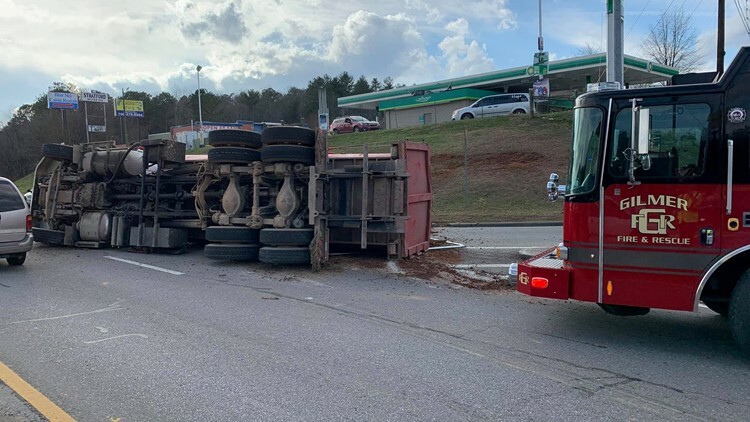 The Ellijay Police Department and Gilmer County Fire Department are working to clear an overturned semi truck at Maddox Drive and Georgia Highway 515. Details on the cause are unclear however photos from the scene show at least one lane blocked by the truck itself with emergency vehicles also parked nearby. In the meantime, police are asking anyone driving in the area to avoid the intersection for the time being. But the news also comes as 5 p.m. traffic looms.